It is fashionable, both in the charmed circles of the city's elite and in academic debates, to debunk Chandigarh as a soulless city with a choking monotony of 'matchbox architecture' and a chess-board, grid-iron layout of roads — perhaps more suitable for a military cantonment than a city. Today, with Chandigarh turning 50, it is time to introspect and invent new models for its future planned growth, says Rajnish Wattas, Principal, Chandigarh College of Architecture. WHEN Chandigarh was conceived it was a cause of celebration for the adherents of modern architecture. The new masters - Le Corbusier, Frank Lloyd Wright, Mies van der Rohe and Walters Gropius - were building no-frills, sleek creations in steel and glass or concrete. Decadent, meaningless ornamentation was out. The theory behind Chandigarh's architecture was 'form follows function'. Streamlined horizontal and vertical lines, plasticity of forms, play of voids and masses with glass and concrete were the new aesthetics of architecture. Time could not be more propitious for Le Corbusier, the architect-planner of Chandigarh. Pandit Jawaharlal Nehru's historic mandate was, "Let it be a new city`85 unfettered by the traditions of the past`85" And a brand new city it was. Cynics called it as an implant on native soil, turning up its nose at the timeless architectural heritage of India. The elegant, cuboid, High Court building by Le Corbusier. 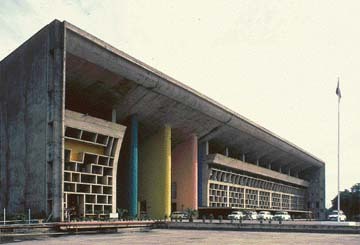 Le Corbusier was justified in opting for modernism when it came to building Chandigarh. What paradigms of civic and secular architecture did India have to offer as an inspiration for the new city? We only had our palaces, temples, tombs or mosques. Except for Jaipur, what else was there to study at an urban scale? Time had changed, technology had changed and so had the needs of the people. The colonial edifices of Lutyen's Delhi were too imperious to provide any appropriate linkages with the past. And most other old towns of India were notorious for their squalor, chaos and unhygienic conditions. A new country had been born, a new state had been carved out, a new capital was to be made - what else, but the idiom of modern architecture could construct it? It is fashionable both in the charmed circles of the City's elite and in academic debates to debunk Chandigarh as a soulless city with a choking monotony of 'matchbox architecture' and a chess-board, grid-iron layout of roads - perhaps more suitable for a military cantonment than a city. Yes, today with Chandigarh turning 50 it's time to introspect and invent new models for its future planned growth. But what about modernism as an idiom of Chandigarh's architecture? What really symbolises Chandigarh's style? 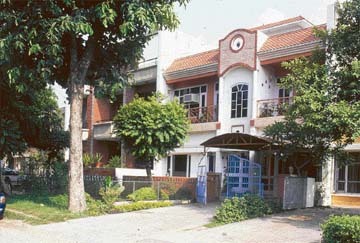 There are two major perceptions of its architectural style: One, the great edifices of the Capitol Complex and other major buildings designed by Le Corbusier himself, and two, the numerous government houses and institutional buildings designed by Corbusier's associates such as Maxwell Fry, Jane Drew, Pierre Jeanneret and major Indian associates like M. N. Sharma, Aditya Prakash, B. P. Mathur, Jeet Malhotra, S. D. Sharma and others. The Capitol Complex, with its powerful architectural edifices, is perhaps one of the most beautiful architectural creations of the 20th century and will remain so for centuries to come. Only Corbusier, with his multi-faceted genius of architect-artist-poet-philosopher, could have created such powerful and magnificent creations in concrete; which he called the "molten rock of the 20th century." But, the irony of these great edifices is that these are essentially "architects' architecture." They are a bit too abstract and esoteric for laypersons to appreciate. In spite of Chandigarh's claim of having one of the most literate, culturally and intellectually alive citizenry, these buildings somehow or the other fail to communicate their 'genius' to them. I have often asked enlightened friends and myself pondered over this chasm between the public perception of Chandigarh's architecture and the architects' perception of it. In contrast, look at the positive response that the Lutyen's Capitol at New Delhi evokes. Is it the colour and texture of the sandstone, the formal symmetrical layouts or vistas, focal points that lend it greater coherence and, therefore, a better understanding? While these edifices have been absorbed into the Indian psyche as 'Indian architecture', Corbusier's work still stands aloof, suffering from an identity crisis. Is it a lack of an aesthetic education among the people, the harsh ruggedness of the concrete in hot summers or abstraction of forms and details that are responsible for this impression? But clearly pure modernism in architecture does not tug at the heartstrings of the common man. The other major impacts of Chandigarh's visible imagery and urbanscape are the simple, austere brick houses with plastered, whitewashed bands of chajjas and cantilevers. Given the tight budgets and financial constraints, the architects created a beautiful new aesthetic out of ordinary, local materials. Their simplicity, clarity of functions and spaces are so admirable and yet have earned notorious, irresponsible and at times callous epithets like 'matchbox architecture'. Where is the lacuna? Is it simply a case of people's innate desire for the ornate and the ostentatious or simply too many expectations from a new city, formed without giving due consideration to the budgetary constraints facing the architects designing the the city? And then there is the usual refrain of lack of verandahs, courtyards and other traditional climate-friendly architectural devices. But then low-cost mass housing can hardly ever satisfy all the criteria of perfect housing. Yes, on the climate-friendly aspect, these housing designs can be faulted; but verandahs, balconies etc. require cantilevers, which add substantially to the cost, a fact often not realised by people. The other most intense experiences of Chandigarh's architecture and urban design are felt along major avenues like Madhya Marg, Dakshin Marg, shopping streets and, most significantly, at the City Centre in Sector 17. While order, a sense of direction and right-angled geometry of the roads make for a rational, logical city order, these also creates monotony and a repetitive symmetry. The avenues where people move and, therefore, experience the city, do not generate enough variety of architectonic forms, shapes, landmarks, or excitement. The City Centre with its vast concrete concourses and controlled architectural expression of uniform buildings, with colonnades below and balconies above, has a sense of majesty, balance and clarity of purpose. Yet, it does not evoke much public admiration. In fact, it's only after sunset, when the bland concrete facades are bathed in the light of the neon-signs on the shop fronts, that the jostling crowds find the city pulsating. Perhaps, as far as the city is concerned, the famous architectural dictum "less is more" turned on its head to become "less is bore." As Chandigarh turns 50, the metamorphosis in its architectural trends and people's preferences are becoming visible. A large number of huge, rambling houses in modernist styles are being pulled down to make way for the eclectic styles of pseudo-French chateaus, Roman villas with Greek columns, pediments and 'Romeo and Juliet balconies' with sloping roofs in fake Manglore tiles. Gautam Bhatia with his acerbic pen has labelled these styles as 'Bania Baroque' and 'Punjabi-pop' of the show-and-tell architecture of new money. Even the smaller marla houses and shop-fronts are being given facelifts with pediments, arches, fluted columns and other architectural fantasies quarried from historic styles by their proud owners and complying architects. It is the ultimate pop architecture reverberating to the 'bhangra-rap' of people's applause! Often, as the joke, goes, "there are more pediments to be seen in Chandigarh than in Athens." Is this a spillover of the Gurgaon brand of 'post-modernism'? Or just a rebellion against boredom of the purist brand of modernism? But the Chandigarh skyline is changing for sure and will do so even faster in times to come. One of the reasons for people's disdain for the purist, austere modernism in architecture is perhaps the lack of richness of details, romance and art in it - an integral part of our timeless traditions of vernacular and historic architecture. Be it the humble hut in the Kutch desert or the havelis of Jaisalmer or a tiny wooden temple in the hills - architecture has always been a celebration of life. It was never a "machine to live in", as Corbusier once described the functions of a house. While it is pointless for the custodians of the heritage of the city to adopt a rigid posture and advocate freezing the city in time and space, it is equally important that the enlightened citizenry of Chandigarh does some serious stocktaking and debates about the identity crisis that their beloved city today faces. Why not begin with the commonalities which both the custodians of the city's heritage and the champions of change agree upon? One thing that every Chandigarhian loves is its clean, sleek, orderly and confusion-free layouts. The other is that the people are immensely proud of its 'Garden City' character. The meandering Leisure Valley with its myriad colours and textures of its trees and flowers, attracts the city-dwellers. Then there are other theme gardens like the Rose Garden, Terrace Garden, Fragrance Garden, just to name few. Its richness of trees - both in the gardens and along the avenues, ranging from venerable old peepals to exquisitely flowering seemuls, kachnars, jacrandas, gulmohars and amaltases - is another point of pride for Chandigarhians. In spring it's a symphony of changing colours as these trees bloom with radiant blossoms. Recently, the previously ill-maintained Sector Greens have been transformed into well-developed neighbourhood parks. The Sukhna Lake is another place which has a special place in the hearts of the people of the city. These, too, are gifts of the original planners of the city and their visions of modernism. The people also appreciate and understand that it was the modernity of the city and its sleek architecture that created a mindset of forward looking, zestful, ambition-driven new generation. The city has its fair share of achievers in the fields of technology, science, civil services, sports and creative arts. The art and culture scene is also picking up, propelled by the spirit of 'dare to dream'. So let's not throw the baby out with the bath water. The city, like any living organism, will continue to grow, evolve and reinvent itself. It is imperative not to lose our perspective and our respect for our precious heritage, but still change, and change in an orderly, designed way. Let's educate our school children about the spirit of the city and the context in which it took birth. Let not garishness, meaningless, and popular public taste destroy the very fabric of the city's personality. Chandigarh should go from modernism to even more beautiful and true modernism; based on lasting understanding of the principles of art and architecture, but should never decay into meaningless, consumerist hedonism.